A legume common in Indian cuisine. Chana dal resembles yellow split peas but is actually split black garbanzo beans without their seed coat. Chana dal is an excellent source of protein, and has a low glycemic index, making it suitable for diabetics. Chana dal is a smaller chickpea called desi, and the commonly used variety of this is called myles. It's a red chickpea that is skinned and split to become chana dal. It is more closely related to garbano beans or chickpeas. 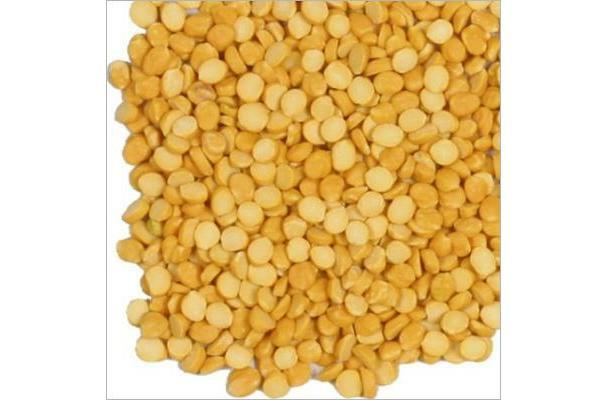 Only, chana dal is younger, smaller, split, sweeter and has a much lower glycemic index. Buying: Try Indian grocery stores. Procuring: Chana dal is produced by removing the outer layer of kala chana or black chickpeas, and then splitting the kernel. Machines can be used to perform this process, but it can also be done in the household by soaking them first, before removing the loose skins by placing the chickpeas between two towels and rubbing with a rolling pin. Soften chana dal before use by adding 1/4 teaspoon of baking soda to the water before boiling. Don't do this though if you're using a pressure cooker, otherwise it will turn to mush. Many use pressure cookers instead these days.